Hey dolls! Today I have pictures of the Zoya Gloss collection. I was most excited about this set because they are all jellies and you all know how much I love a jelly sandwich mani! Paloma is a deep fuchsia-berry jelly. It had the best formula out of this collection. Three coats of Paloma were used in the pictures below. The visible nail line is much more apparent in the pictures than it was in real life. I then sandwiched two coats of Orly Spazmatic between another coat of Paloma. Spazmatic is a blue hexagonal glitter that also has a blue-violet shimmer. These two looked great together! Zoya Frida is a dark, warm-toned teal blue jelly. I was most excited about this shade because it is not one we typically see in a jelly formula. Frida’s formula was the most sheer and problematic. Five coats were used in the pictures below. Luckily, Frida dried relatively quickly so I did not have to wait long in between coats. For the jelly sandwich, I added one coat of Milani Hot Pink and another coat of Frida. Hot Pink is filled with silver and pink hexagonal glitter. I wore this combination for several days and it garnered lots of compliments. Katherine is a dark red-toned aubergine. This shade was just okay to me. Four coats of Katherine were used in the photos below. I have wanted to attempt a jelly sandwich using flakies for awhile, so I pulled out Zoya Chloe. Chloe is from Zoya’s Fleck Effect collection and is a sheer pink base filled with flakies that flash red, orange, gold, green, and blue. Two coats of Chloe were used and then an additional coat of Katherine. I love all of the jelly sandwich combos that I came up with! If you are a fan of jellies, you will probably want to add a couple of these to your collection. Frida and Paloma were my favorites. Zoya polishes can be purchased for $8. 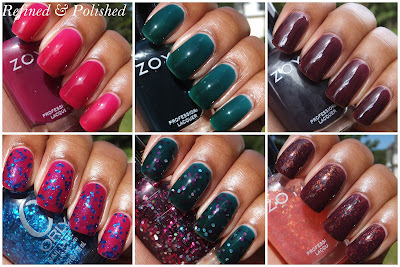 Only one more fall Zoya collection to go!